Do Children’s Developmental Vulnerability Vary Over Locations? 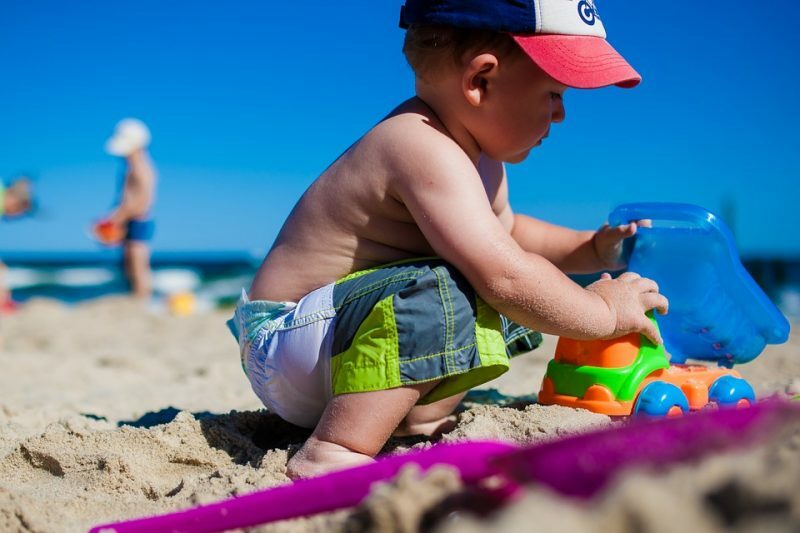 A survey by the Australian Bureau of Statistics (ABS) found that 3.4% of children aged 0-4  years and 8.8% of 5-14 years have shown some forms of developmental vulnerability. Early detection of such vulnerabilities is important for effective intervention. However, specifying the exposed community to such vulnerabilities are also important, particularly determining the social and economic determinants behind these problems. It is equally, if not more, important to detect the compromised neighborhoods and their effect on children’s growth. These will help to regulate policies and allocate more resources where required. To assist policymakers in understanding the most vulnerable locations in Australia, we conducted a study: A macro-level approach to assess the early developmental vulnerabilities of children in Australia: A local government area-based analysis. Five development domains: physical, social, emotional, linguistic, and cognitive, and communication of children vulnerabilities were assessed in the paper. Most research investigates the effect of developmental disabilities on individual children, and sample multiple cohorts. However, to get a country-wide picture, a macro-level relationship between childhood vulnerability and the neighborhood’s socioeconomic effect is required. For that, local government areas in Australia were evaluated instead of considering each child as a sampling unit. This is particularly challenging in Australia because of the existing multicultural diversity (28.2% of the population born overseas and 3% Indigenous Australians), which is continuously growing with the yearly migration intake. A location-wise assessment of children’s status-quo in Australia should reveal the weakest areas where children may not have the best resources to develop cognitive, social, and emotional skills. A total of 289,973 Australian children were sampled in their first year of full-time school (5-6 years of age) during 2012 as part of the Australian Early Development Census (AEDC). It provides data on local sociodemographic parameters of children when they start school across five disciplines of early childhood developments: physical health and wellbeing; social competence; emotional maturity; language and cognitive growth (schools-based); and communication skills and general knowledge. Two standout issues that were found to be significantly associated with the five domains of children’s early development vulnerability — family financial capability and family composition (single or couple). Economic hardships pose a number of problems such as inadequate and crowded living conditions, inappropriate schools, limited access to health care and childcare, and so forth. Similarly, single parent family increases further developmental risks. Single parent families in Australia reached 15% in 2012 with 67% of them having dependents with them. Among them, 81% of them are single mothers. Unfortunately, female participation in the labor force is only about 65.1%. These create both a psychological and financial burden on mothers and, subsequently, on their children. A child’s communication vulnerability was found to be associated with the unemployment ratio in the local area. Delinquent behaviors are common among children with unemployed parents. It is partially due to poverty as well as a parent’s inability to provide support to the child’s behavioral and emotional problems. Furthermore, research has shown that these effects never get erased, even when the child reaches adulthood. Another interesting finding was that a high number of early language- and cognitive-vulnerable children were found in areas where most houses lacked an Internet connection. Internet worked as a positive stimulant for children’s language and cognitive development. The Index of Relative Socio-Economic Disadvantage (IRSD) is an index score developed by ABS to present the socioeconomic status of a community and identify the areas that are relatively underprivileged. We found that one unit increase in this disadvantage score in any local government area resulted in approximately 2% decrease in the vulnerability of children, which was expected. Thus, local seriocomic status impacts children’s physical and mental growth. Figure 1: The geographical position of areas with the highest emotional vulnerability and lowest IRSD. The size of the marked circles, in both cases, displayed the vulnerability measure as well as ISRD score of the location; that is the greater the circle radius, the higher the score. That means, the bigger the circle, the higher the vulnerability and lower the ISRD. Republished with permission from Elsevier from https://doi.org/10.1016/j.childyouth.2018.07.005. 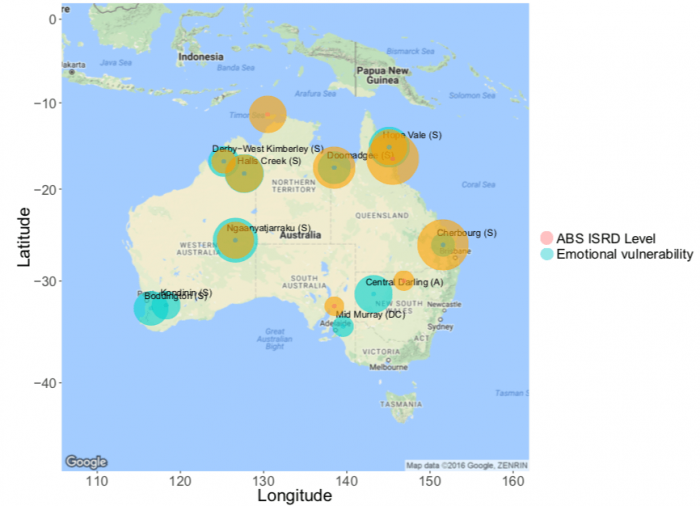 A comparison of IRSD and emotional vulnerable children’s location in Australia were shown in Figure 1; here, the worst 10 local government areas in Australia for a child to grow up were displayed. The geographical results for all five domains provide a glimpse of the most vulnerable areas of Australia. Most of the deprived and underprivileged zones are remote areas, most often with a higher proportion of the aboriginal population. This shows why policymakers need to consider the area-wise difference and allocate resources to the remote regions to ensure early interventions for the developmental vulnerability of children. These findings are described in the article entitled A macro-level approach to assess the early developmental vulnerabilities of children in Australia: A local government area-based analysis, recently published in the journal Children and Youth Services Review. This work was conducted by Raaj Kishore Biswas from the University of New South Wales and Enamul Kabir from the University of Southern Queensland. Enamul obtained PhD degree from the University of Southern Queensland (USQ) in 2011. 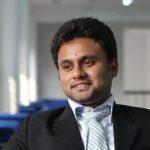 His research focused on data mining algorithms and he developed efficient, effective and realistic methods in the privacy-preserving data-mining field, using three core techniques: statistical disclosure control, purpose-based access control and data anonymization.